This week’s theme is chess, which is probably the most popular and prolific game in the world. Variants of the game exist in virtually every culture, many of them dating back as far as the 7th century. Although many of the variants of the game have different pieces and different rules, they all share a lot of common game mechanics and concepts. Because the game is so ubiquitous, it isn’t unusual to be able to play a full game with someone who doesn’t speak the same language as you. While I myself do play chess, it isn’t my favorite board game (that would be backgammon). However, I absolutely love the way that a chess board with all of the pieces set up looks, say sitting on a shelf or a table. Yes, I’m one of those people. If I didn’t have cats, I would absolutely have a nice chess set decorating my home. Sadly, as any cat parent could tell you, a chess set wouldn’t last long just sitting out in the open like that. One of the things that I noticed about 3D printed chess sets is that the choice of what material to 3D print them in is pretty important. I think this is one of those times when it might be worth skipping the old FDM printer and opting to have the pieces printed on professional-grade machines. It may cost you some money, but I think it would absolutely be worth it. If you’re going to do something, then you should do it right, that’s what I say, and some of these designs are just too nice for whatever filament you happen to have lying around. The most common chess piece design is the Traditional Staunton, and it is likely that if you have a chess set in our home, it is that one. This great modern update of the classic Staunton, named for a chess master named Howard Staunton, is just a nicely designed set of chess pieces. They are simple and understated, so they can be used on any type of board. Because the pieces are smooth and simple, with no unnecessary lines or details, these pieces would look great 3D printing in a transparent material. If you have access to a SLA 3D printer they would look amazing. I like any chess piece design that completely rethinks the way the piece should look, without making the pieces unrecognizable. This great set makes the pieces look like modern, abstract sculptures that you would see in an art gallery, but it is completely obvious which piece is which. And even as a standalone piece, any of them could be sized up and 3D printed to use as a cool sculpture, which is not always something that can be said about a game piece. Just a warning, these 3D models are very detailed, so if you plan on printing them on an FDM printer it would be a good idea to make them pretty large, between three and five inches tall. If that isn’t possible, having them 3D printed on an SLS or an SLA 3D printer is probably your best bet. This set would look great in metal, but because metal filaments need a lot of post processing they wouldn’t work very well here. But I think the pieces could be painted with a metallic paint and look pretty stunning. I love the concept of this chess set, the pieces are almost like cookie cutters that have been stood up on their ends. Each piece is a silhouette of the classic chess piece design, so they have a great, simple design. It is easy to tell which piece is which, and they should be pretty easy to 3D print and durable. This is a nice alternative to a basic, everyday chess set. Any standard PLA or ABS material would be great for this set, but any material that is durable and forgiving of striation is ideal. You pretty much just need to pick two colors that you like and you’re all set. And hey, in a pinch you can use them to make cookies. To be perfectly honest, this probably isn’t a chess set that you would want to actually use to play. Sure it can be done, but as with most “themed” chess sets it isn’t always going to be easy to know which piece is which. I picked this set because all of the pieces are based on famous skyscrapers, so when the set is assembled it just looks cool. The king is the Willis Tower, the queen is Empire State Building, the bishop is the Chrysler Building, Columbia Center is the knight, Hearst Tower is the rook and the KOIN Center is the pawn. It even has a great board that is designed to look like city blocks with cars driving along the streets. Just have it printed out and either laminated, or you can make it more permanent by affixing it to a solid board. If you want to use this chess set as a decorative set, then it is the perfect place to use an interesting or unique material. The pieces would look great in a transparent material, but I think they would also look stunning in metallics. Cy Endfield is a famous screenwriter, director, author and a magician. Apparently, he also designed a set of chess pieces back in the ’70s that were produced in gold and silver. The set was a limited edition so only about a hundred sets were made. What made them unique was the fact that all of the pieces could be fit together so they would be easy to store and travel with. Why anyone would want to carry a set of solid gold chess pieces with them is a mystery to me, but I guess it’s nice to have as an option. I think the portability of these pieces makes them ideal for a travelling chess set, but you should probably not have them 3D printed in precious metals. If you plan on really packing them up and taking them with you when you travel, then a better material would be a durable ABS. So I’ll be honest, I had no idea who Cy Endfield was. I mean, I have seen or heard of plenty of his films, but the name didn’t really stand out. But Charles O Perry is another story, he is a very prolific artist and designer who is known for creating large-scale, abstract sculptures. His work can be found all over the country in front of dozens of museums, government buildings and parks. He also designed jewelry, the style of stackable chairs that you’ll find in the waiting room of any doctor’s office and a series of puzzles for MOMA and the Smithsonian. He also created a stunning interlocking chess set that inspired this 3D printed set. The pieces are simple enough that they could be printed in metallic filament, but I don’t really know how they would look. The original set was made from stainless steel, but personally I think these pieces would look amazing in a clear material. This is a great twist (cough) on the standard chess set, and would be great either as an everyday set, or prominently displayed. According to the designer the pieces are pretty big, so you’ll need a large chessboard for them. He suggests that they can be printed at 75% if you want them smaller, but I worry that they wouldn’t look as nice if they were smaller. I think the biggest concern that you’ll have printing this set is making sure that your printer has a high enough resolution to deal with the curves in the body. Any material would probably be fine for these pieces, but I did notice a few of the Makes on Thingiverse printed them with metal filaments, and they looked really cool. Aside from being a great band, Bauhaus is also the name of the famous art school in Germany that popularized the Modernist, or Bauhaus, design movement. Modernism wasn’t a new concept by the time the school was founded, but while it was open between 1919 and 1933 it defined the style, philosophy and aesthetic of the modern Modernism movement that still inspires designers today. This fantastically designed chess set is simple enough that it would look good in any material, but I think it would look amazing 3D printed in sandstone. Not only would it give the pieces an interesting texture, but it would be very fitting for the Bauhaus style, which commonly used simple, graphic shapes made with stone or roughly textured materials. 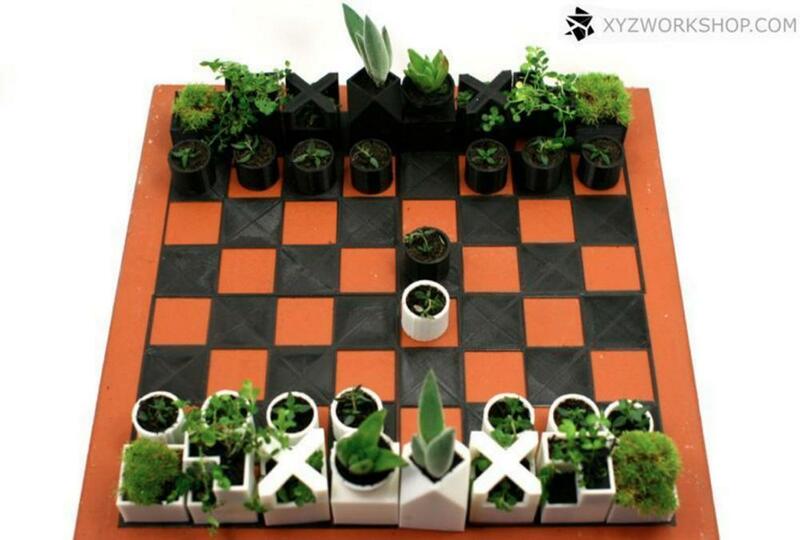 The impracticality of having a chess set of living plants is probably high on the list of reasons why this chess set isn’t for everyone, but it is such a cool design that I had no choice but to include it on this list. The designer clearly chose the plants that they used when they photographed it for looks, and I doubt they would stay the manageable size in the pictures for very long. But I think a better plant selection would be succulents, which grow slowly, are really hard to kill, and always look cool. This would be a cool chess set to leave in your garden or on your porch, however it will still need to be protected from the elements. The star of the show is the plants themselves, so any material will do really, although I’d go with something durable. Using metallic filament would also be pretty cool, especially because the pieces would start to get a patina as they spent more time outside. Yo dawg, I heard that you like chess, so we put a chess set inside of your chess set so you can play chess while you play chess. I know that’s a dated meme, but I honestly can’t imagine a more appropriate time to use it. But this isn’t just a novelty chess set, it’s actually a really cool chess variant that allows you to play chess on the large scale, and then move the smaller chess pieces based on their proximity to other chess pieces. The goal is to capture the small king. So it really is a chess set within a chess set, and that sounds kind of amazing. As if regular chess wasn’t a complicated enough, why not add an entire extra level of difficulty to it? The rules are available for download from YouMagine. These pieces will look fine printed in just about any material, but because the smaller pieces are so tiny just make sure that it’s being printed on a machine with an extremely fine print resolution, or in a forgiving material. Although personally I think this chess set would also look pretty great in translucent materials, especially if you have access to a SLA 3D printer. There you go, ten of the coolest and most interesting 3D printable chess sets available. This isn’t even close to an exhaustive list, and was actually pretty hard to narrow down to just ten, so if you’re in the market for a new chess set make sure that you take a look around, you’re bound to find something that is perfect for you. Incidentally, last week I was asked by a reader exactly what I look for when I put my Weekly Roundups together, so I figured I’d answer that question here in case anyone else was interested. First of all, I pick the week’s theme based on my mood really. Sure sometimes I’m inspired by something specific if a subject is being talked about a lot, but honestly if the subject bores me then I probably won’t put a list together about it. Also, even if a model isn’t suitable for the week’s theme, I keep a (rapidly growing) collection of random models that I intend to fit into roundups at a future date, so feel free to send me your design if you think I’d like it. In terms of the models that I pick, that is really trickier to nail down. First and foremost it has to be a well-designed model, but I also take into account if the model has been successfully 3D printed and if it has some quality pictures uploaded. I hate using bad pictures, and there have been times that I’ve dropped something off because it looked like the pictures of the prints were taken with a camera phone circa 2003. High-quality pictures are my best friend. As always, I love to see what you’re 3D printing, so feel free to email me or just send me a Tweet @SJGrunewald and show me what you’re working on!